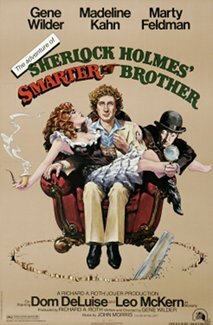 The Adventure of Sherlock Holmes' Smarter Brother is a 1975 American musical comedy film with Gene Wilder, Marty Feldman, Madeline Kahn, Dom DeLuise, Roy Kinnear and Leo McKern. The film was Wilder's directorial debut, from his own original script. Douglas Wilmer and Thorley Walters appear as Sherlock Holmes and Dr. Watson, respectively. Wilmer had previously appeared as Sherlock Holmes in the 1960s BBC TV series, and Walters played Watson in three other films: Sherlock Holmes and the Deadly Necklace (1962), The Best House in London (1969), and Silver Blaze (1977). In 1891, Foreign Secretary Lord Redcliff haphazardly receives a document with unknown contents from Queen Victoria; the document is stolen from his safe later that night. Sherlock Holmes and Dr. Watson discuss the case. Deciding to lie low for a while, Holmes informs Watson that he will delegate cases to his younger brother, Sigerson (Gene Wilder), who has toiled in his brother's shadow without credit for decades. At a train station, and dressing in drag to avoid a would-be assassin, Sherlock passes the message to Scotland Yard records clerk Orville Sacker (Marty Feldman), a man with auditory eidetic memory, who happens to be a fan of Sigerson's work. Arriving at Sigerson's flat, Sacker finds him practicing his fencing and swordplay. Sigerson expresses bitterness and resentment over being unable to replicate Sherlock's success, mocking his big brother as "Sheer Luck" Holmes. Arriving next is a woman claiming to be Bessie Bellwood, but Sigerson sees through her ruse almost immediately by stumping her with his knowledge of Bellwood's repertoire and the fact that Bellwood had died in 1879. Eventually, after some interrogation—it soon becomes clear that the woman is a habitual liar—she reveals herself to be Jenny Hill, a music hall singer who believes she is being blackmailed by opera singer Eduardo Gambetti over a lewd letter she sent him. The assassin finds out about Hill's and Sigerson's meeting and reports it to an obviously math-challenged Professor Moriarty. Sigerson attends one of Hill's performances and saves her from another would-be assassin by injecting himself into the play from the audience and directing Hill through a musical number. He then saves her again when two hansom cabs accost her on her way home; the trauma prompts Hill to temporarily stop cooperating in the case. Sigerson (dismayed that Sherlock got credit for saving Hill in the newspaper) is invited the next day to her dressing room, where he uses the power of seduction to both make love to her and find out further details. She reveals that she stole the document from Redcliff's safe and claims that Redcliff is her father. When Sigerson meets with Redcliff, he learns that Hill is not Redcliff's daughter, but his fiancée, and that Hill had lied to Sigerson again. Eventually the trail leads to Gambetti, who has made a deal with Moriarty to sell him the document, which foreign powers have offered £50,000 (£5.4 million today) to acquire. Moriarty pays, but the distrustful Gambetti proposes that he hand over the document during the debut of his opera (a botched "translation" of Giuseppe Verdi's Un ballo in maschera) so that he has time to safely deposit the money. Sigerson and Sacker infiltrate the opera, which soon devolves into chaos. Sigerson and Moriarty confront each other backstage and are drawn into a sword fight that corners Sigerson on an outside ledge; at this point, Moriarty explains to Sigerson why he never lived up to his brother's fame: Sherlock was far better at seeing his enemy's moves "two to three steps ahead" of when they happen. Under threat of death, Sigerson agrees to hand over what Moriarty thinks is the document before Moriarty falls off the ledge (shaken by the chimes of Big Ben) and into the water below. The document turns out to be a decoy: Sigerson has left the real document to be found by Sherlock. The final scene is of Sigerson Holmes running through a park to attend Jenny Hill's wedding but finds that she has not gone through with the ceremony and, instead, is waiting for him on a park bench. The lovers reconcile and share in a celebratory dance, accompanied by a disguised Sherlock and Watson. Madeline Kahn as Jenny Hill (initially using the alias Bessie Bellwood), also nicknamed "Miss Liar"
John Le Mesurier as Lord Redcliff, the Foreign Secretary. Wilder was having lunch with producer Roth when it was suggested that Wilder spoof Sherlock Holmes. ...I said I had - every other week for a year. But I couldn't see making fun of such a well-loved character in a 140 minute movie. Roth approached Wilder again a week later and inquired if Wilder had given any more thought to the idea of a Sherlock Holmes film. Wilder replied "No, but I have given a great deal of thought to Sherlock's insanely jealous brother Sigi." In his autobiography, Wilder explained that he was further motivated by the experience of working with his Young Frankenstein co-stars Madeline Kahn and Marty Feldman and he wanted to write parts for both of them in his next project. Wilder began writing Sherlock Holmes' Smarter Brother as production was wrapping on Young Frankenstein. On the set of Frankenstein, Mel Brooks warned Wilder that now that he was writing movies, he would eventually move to directing movies to protect his scripts. After Smarter Brother, Wilder would go on to write, direct and star in three more features over the next ten years (The World's Greatest Lover in 1977, The Woman in Red in 1984, and Haunted Honeymoon in 1986). Wilder's screenplay reveals a deep knowledge of Conan Doyle's characters as Marty Feldman's character, Sgt. Orville Stanley Sacker, shares a similar name with that originally applied to John Watson, Ormond Sacker. One has to be discreet when one talks of high matters of state. You are right in thinking that he is under the British government. You would also be right in a sense if you said that occasionally he is the British government. [...] Mycroft draws four hundred and fifty pounds a year, remains a subordinate, has no ambitions of any kind, will receive neither honour nor title, but remains the most indispensable man in the country. —  Sherlock Holmes, "The Adventure of the Bruce-Partington Plans"
Mycroft is mentioned briefly in the beginning of the film, which presupposes that Holmes was one of three brothers. Sigerson's name refers to an alias used by Sherlock Holmes in "The Adventure of the Empty House". Kahn's character is named after singer Jenny Hill; she initially uses the pseudonym Bessie Bellwood, but Sigerson sees through the ruse and notes that the real Bellwood had died over a decade prior (in reality, Bellwood and Hill were both still alive in 1891 and died in the same year, 1896). The portrayal of Professor Moriarty as having difficulties at math was a parody of Moriarty's expertise in math in Doyle's books. The film earned $9.4 million in rentals in North America during its theatrical release. Vincent Canby of The New York Times called the film "a charming slapstick comedy" that like Young Frankenstein "is full of affection and generous feelings for the genre it's having fun with." Arthur D. Murphy of Variety wrote, "Gene Wilder now joins Brooks in that elusive pantheon of madcap humor, by virtue of Wilder's script, title characterization and directorial debut, all of which are outstanding." Gene Siskel of the Chicago Tribune gave the film two stars out of four, calling it "tedious" and Sigerson "a bland character at the center of a gimmick-filled movie" that "recalls the great detective only by name and occasional costume. There's really no story here, and certainly no mystery." Charles Champlin of the Los Angeles Times declared it "a light, easy, brisk but unforced, professional, kindly and ingratiating trip through Holmes' sweet home as it never was." Gary Arnold of The Washington Post called it "an enjoyable, encouraging beginning" to Wilder's career as a writer-director that "reveals a surprisingly inventive and conscientious comic imagination at work." Pauline Kael of The New Yorker stated that Wilder "wrote the roles for the actors but didn't write characters for them to play. He provided lots of lovely, sideswiping bits of business but no conceptions that would allow the actors to surprise us with something new or that would enable us to get involved in what's happening to them." John Pym of The Monthly Film Bulletin called it "better in its parts than as a whole, and essentially a showcase for the individual performances of Wilder himself, Marty Feldman, Madeline Kahn and, particularly, the perpetually energised, rubber-faced Dom DeLuise." The film was released on DVD on April 4, 2006. ^ "The Adventure of Sherlock Holmes' Smarter Brother, Box Office Information". The Numbers. Retrieved May 22, 2012. ^ Variety film review; December 3, 1975, page 22. ^ "The Adventure of Sherlock Holmes' Smarter Brother". IMDb. ^ a b c d Alan Barnes (2002). Sherlock Holmes on Screen. Reynolds & Hearn Ltd. pp. 9–10. ISBN 1-903111-04-8. ^ Canby, Vincent (December 15, 1975). "Adroit 'Sherlock Holmes' Smarter Brother'". The New York Times. 42. ^ Murphy, Arthur D. (December 3, 1975). "Film Reviews: The Adventure Of Sherlock Holmes' Smarter Brother". Variety. 22. ^ Siskel, Gene (December 22, 1975). "'Smarter Brother' a half-wit". Section 3, p. 12. ^ Champlin, Charles (December 14, 1975). "A Wilder Whodunit Than Most". Los Angeles Times. Calendar, p. 54. ^ Arnold, Gary (December 19, 1975). "A Madcap Upstaging Of Brother Sherlock". The Washington Post. C1. ^ Kael, Pauline (December 22, 1975). "The Current Cinema". The New Yorker. 70. ^ Pym, John (February 1976). "The Adventure of Sherlock Holmes' Smarter Brother". The Monthly Film Bulletin. 43 (505): 23.